Much of the information on Hugh Fraser on the web or in books is woefully inaccurate. The following story of his life is by far the most complete and accurate to be published, but if any reader spots a defect, or can add to it, then amendments are most gratefully received! Braelangwell House, now the home of Hugh and Linda Mitchell. Photograph by Andrew Dowsett. The hill fort of Copaul Droog, the capture of which led to the knighthood of Sir Hugh Fraser of Braelangwell. Photograph by Paul Mackenzie Fraser. Hugh Fraser was one of the longest serving military men in the East. He must have had the constitution of an ox, given the mortality rate of soldiers and their families in India at the time. Clearly as an officer through and through he was used to giving orders and following orders. Civilian life where people did not necessarily do what they were told must have been a challenge! We know that Hugh Fraser was a generous man. Benefits to the Northern Infirmary and the deserving poor regularly flowed from his purse. He must have been keen to have children. Four children with his first wife Marie Louise Jeanne Helene De La Sauvagère in India, three of whom survived to adulthood. A second marriage with Isabella Mackenzie of the Kincraig family, many years younger than him, was followed by five more children, two born in India and three in Scotland. Four of them survived to adulthood. However, with servants to help, and the children being sent away to schools, perhaps family life was not quite what most of us are used to. Unlike many other northern proprietors, Fraser of Braelangwell did not get involved in litigation with neighbours. Perhaps he had picked up from his lawyer father that only the legal profession benefits from a dispute. Similarly, he does not seem to have been swift to use the courts to get his tenants to pay their rent, again unlike most of his circle. However, curiously he did decide to take on most of the beneficiaries of his brother’s will, leading to a series of expensive actions in the High Court of Chancery. With his father being a Commissary, he would have been well aware of probate processes. There was much money involved. Presumably, he would have used his military nous to weigh his chances of success against the losses that could be sustained. If someone has explored the basis of this litigation, held at the PRO in Kew, please let us know. His father, William Fraser (c1731–1811), was a solicitor who became the depute Commissary of Inverness in 1762, and Commissary of Inverness in 1778. The Commissary acted as a judge in the Commissary Court, which confirmed wills and testaments, registered inventories and settlements and dealt with executry matters generally, and had jurisdiction over a range of other activities like actions of slander and maintenance. In one document, Hugh Fraser’s father is called “William Fraser junior” which, whilst not conclusive, suggests his father was also William. I have researched numerous avenues for the antecedents of Sir Hugh without a definitive result, but we will get there – watch this space! Update 22 July 2018: I think William Fraser, the Commissary, was of the family of Fraser of Ardochy (on the south side of Loch Ness, near Fort Augustus), although there was much association with the Frasers of Errogie. Curiously, the Commissary had an earlier relationship with the Black Isle than Sir Hugh – in the 1760s, when Lord Pulteney and Sir John Gordon of Invergordon were battling it out to create votes to become MP for Cromartyshire, the Commissary (who at this time called himself William Fraser of Ardochy) “purchased” land in the parish of Cromarty which entitled him to vote for Lord Pulteney. There is a long series of legal challenges around these votes which are I confess very tedious to read but which would yield more on the Commissary’s activities. I note that in 1768 Sir John’s factor, and Commissary of Ross, John Gorry wrote to a friend, “I hope Fraser of Ardochie who has been for some time at Edinr. has been Examined at Our Instance – that Gentlemans Conduct in his former Declarations has been very Extraordinary by all Accounts of it”. The Commissary also appears in a series of sasines relating to land transfer which also seem a little dubious; in the Index to the Particular Register of Sasines he thus appears as “William Fraser of Ardochy, writer, Inverness, formerly writer, Edinburgh, XI.145 153, 169, 403, 471; XIII.310”. Who his parents were I still have not found out, although I have identified quite a few brothers and sisters. Continue watching this space! His mother was Jean Fraser of Errogy (c1747–1826). Errogy, or Errogie, lies to the south of Loch Ness. Hugh Fraser’s entry in Dod’s book on the Peerage, Baronetage and Knightage (1844) states that his mother was the niece of General Simon Fraser (1729–1777) who died at Saratoga (in the American War of Independence). For those wishing to follow this up, Simon was a younger son of Hugh Fraser of Balnain, by his wife, a daughter of Fraser of Forgie. At Saratoga, the American commander noted the organised activity of Simon on the battlefield directing and encouraging his men, and had a long-range shooting expert target him until he fell, mortally wounded. I note, by the way, that General Simon’s younger brother Charles was Commissary of Inverness prior to Hugh’s father, so a close connection with the Balnain family is very likely. This is all the more so as Charles appointed William as his deputy in 1762, the same year as he became Commissary himself. Charles was based in Edinburgh and had no wish on being appointed Commissary actually to live in Inverness, although he maintained a house there. Hugh Fraser’s parents married at Dores in 1764. Hugh was born in 1773 and, still a teenager, in 1790 “entered the military service of the East India Company in the Madras presidency” (Dod). I think it likely that his elder brother Alexander had been out before him – I know from their mother’s will that although Alexander was in Inverness in 1809 he had previously been in Goruckpore in India; in 1822 he was in London, where he died in 1841. Died on the 30th of June, William Fraser, Esq; Commissary of Inverness, in the 80th year of his age.– He was a man of worth and probity, a kind husband and parent, nor was there ever an individual whose house became more the hospitable resort of his friends while he had youth and health to enjoy their society, or exert his powers to serve them. The baptism record for the children of William Fraser, Commissary of Inverness, and Jean Fraser, is incomplete; indeed, Hugh himself is not to be found within the surviving records, though an extract of the register was used as evidence of his age when he entered the British India service. The following is drawn from the Inverness baptism register, supplemented by information drawn from wills by Sir Hugh, Sir Hugh’s mother and Sir Hugh’s older brother, Alexander, and tombstone inscriptions. I provide the baptismal witnesses (inside quotes) as they are often a clue to family connections. “Alexander Fraser (my 3x great grandfather) was born in Inverness in August 1765. He was employed as a ship’s surgeon on the East India Company’s “Earl Fitzwilliam” from 1789–1790 and then on the naval vessel “Duke of Montrose” from 1791–792. He was then posted as surgeon to Chunar in Uttar Pradesh Northern India SW New Delhi in 1794 then transferred to Gorakpur Uttar Pradesh Northern India NE New Delhi in 1802. All his children were born in Calcutta West Bengal India. The name of his spouse is unknown as well as the date and place of his marriage. It is not known when he returned to the UK or if he lived anywhere else in India. In his son’s obituary it is stated that Alexander occupied a high position in India. 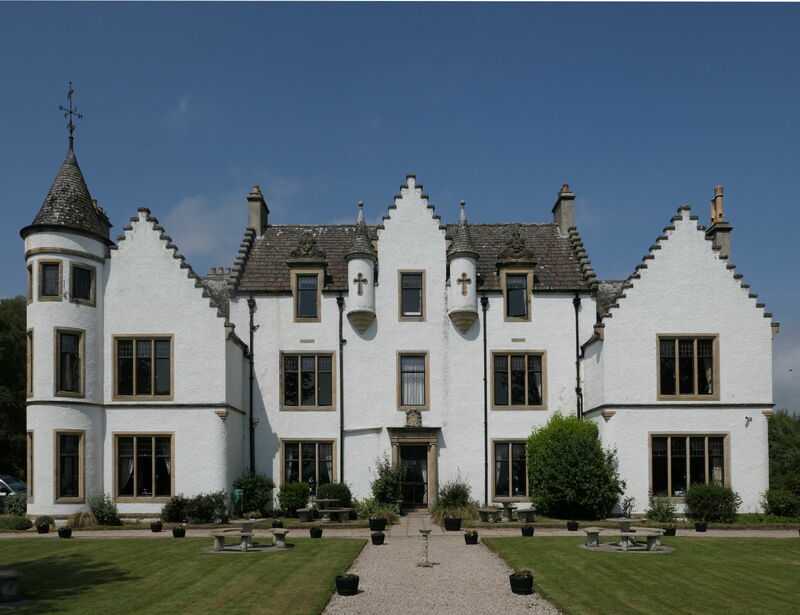 There is documentation that he bought the Acharn Estate in Perthshire Scotland from his son William on May 13 1826. He died in St Pancras London on April 24 1841." Thomas 1772. “Simon Fraser of Farraline Esqre Shirriff and Arthur Robertson of Inches Esqre Witts.” His mother in her will left special instructions for Thomas as he was incapable of acting for himself. Sacred to the memory of Ann Fraser, daughter of the deceased William Fraser, Commissary of Inverness, she died at Inverness on the 21st day of August 1822 in the 43d year of her age. Distinguished through life for her exemplary conduct as a dutiful child, an affectionate sister, a faithful friend and a sincere Christian, her meek and humble spirit quitted this transitory scene of probation in the assured hope of enjoying through the power of Redeeming Love, eternal happiness in the presence of her adorable Creator. Psal XXXIX, 7. “And now Lord what is my hope, truly my hope is in thee”. [both ends] A F: 1822. Under this stone lie interred the remains of Marjory Fraser, daughter of the late William Fraser, Commissary of Inverness & spouse of Alexander Tolmie, merchant in Glasgow, who departed this life the 13th day of February 1818, aged 31 years. Her life was an instructive display of filial affection, conjugal regard, maternal tenderness, sincere friendship and universal benevolence while her death was a most exemplary pattern of submissive placid and consoling Christian resignation. Her surviving sons are William & Alexander. [both ends] A T + M F: 1818. Here repose the ashes of Jane Fraser, eldest daughter of William Fraser, Esq., late Commissary of Inverness, and wife of Captn Simon Fraser. She died on the 8th day of April 1848, aged – years, also of their dutiful and affectionate youngest daughter, Jamesina Fraser, who died on the 31st of May 1873. “Blessed are the peace-makers for they shall be called the children of God”. Matt. 5 chap. 9 verse. Harriet Margaret is mentioned in the will of brother Alexander. She married Major Thomas Dely, H.M.. 38th Regiment of Native Infantry, who died at Cawnpore in 1828. They had one daughter, Jean Anne. Harriet died, aged 68 or 69 (sources vary), at 2, Sion-hill, Bath in 1847. It can be seen that the family as a whole had a remarkable association with the Indian military. It would have been astonishing if Hugh had not followed suit. I Donald Fraser Session Clerk of the Parish of Inverness hereby Certify that Hugh Fraser Lawfull son to William Fraser Commissary of Inverness was born upon the Twelfth and Baptised upon the Fourteenth days of May one thousand seven hundred & Seventy three years by the Reverend Mr. Robert Rose one of the Ministers of the Gospel of the sd. Parish Witnesses Arthur Robertson Esqr. of Inches Captain Angus McIntosh of Kylachy and Captain Hugh Fraser of Knocky Given under my hand at Inverness this Fifth day of April one thousand seven hundred & Ninety One years. / Donald Fraser Ses. / The above is a true extract / Robert Rose Min. A large seaborne British expedition took Rangoon without a fight in 1824, but the war was to prove costly; painting by J. Moore. My italics identify a curious phrase – perhaps some judicious searching in the military records would reveal the diplomatic missions on which he was confidentially employed. Copaul Droog had been notorious, a hill fort considered even more impregnable than the usual dreaded hill fort. Fraser’s activity in the action to take this hill fort, with relative ease, was mentioned when he was awarded his knighthood a decade later. Interestingly, as revealed by Paul Fraser who has visited the location of his ancestor’s triumph, it appears to be a different Copaul Droog from the hill fort of that name where a generation earlier Tipu Sahib had murdered a number of captured British officers. I am indebted for the details of Sir Hugh’s military career to Ann Elizabeth Fraser, Sir Hugh’s descendant, who forwarded to me via her brother Paul several pages of a microfilmed report on his career from an unidentified source. All the details which I have been able to check are exactly correct, so my thanks to the original compiler of this information which forms the basis for this section. 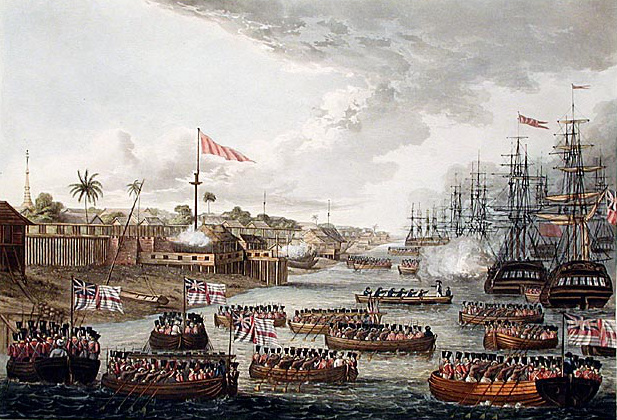 Hugh Fraser arrived at Madras on the “Bridgewater” as a humble Ensign on 9 October 1791, rising to Lieutenant in 1794. He served at the capture of Columbo, an important fortress in the Island of Ceylon, in 1796, and was included on the subsequent prize roll. He was made Captain in 1800/1801, Major in 1805 and Lieutenant-Colonel in 1809. In 1811 he was appointed to command at Pondicherry, a district where French rule was intermittently broken by the British. When he resigned command of Pondicherry in 1816, he received approbation of his conduct. 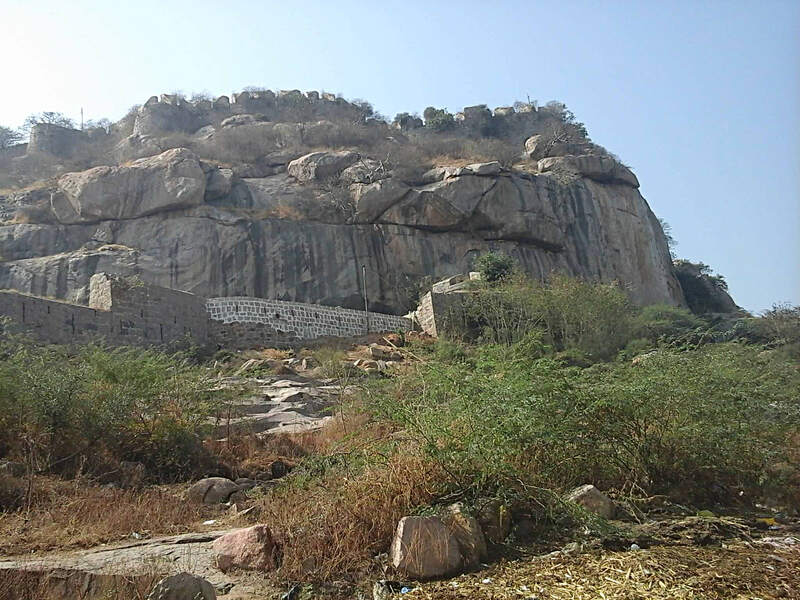 The following year he was appointed to take charge of the garrison at Vellore, a city in the state of Tamil Nadu, in southern India, famous for its 16th-century Vellore Fort, with its imposing granite walls and surrounding moat. However, he was soon relieved of this command and appointed to command the second Brigade of Infantry with Field Force under Colonel Pritzler. 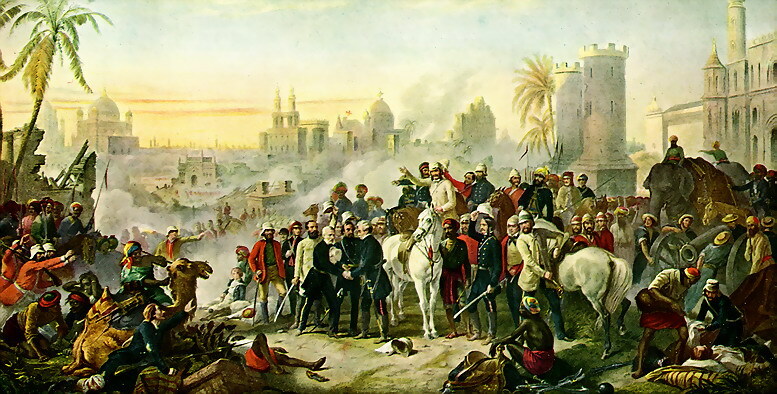 His services in the Battle of Nagpore were subsequently applauded and mentioned in the London Gazette of 6 May 1818. He shared the Prizes for the capture of Singkeir, Shotapore, Pogrunder and Wassotta in 1818. 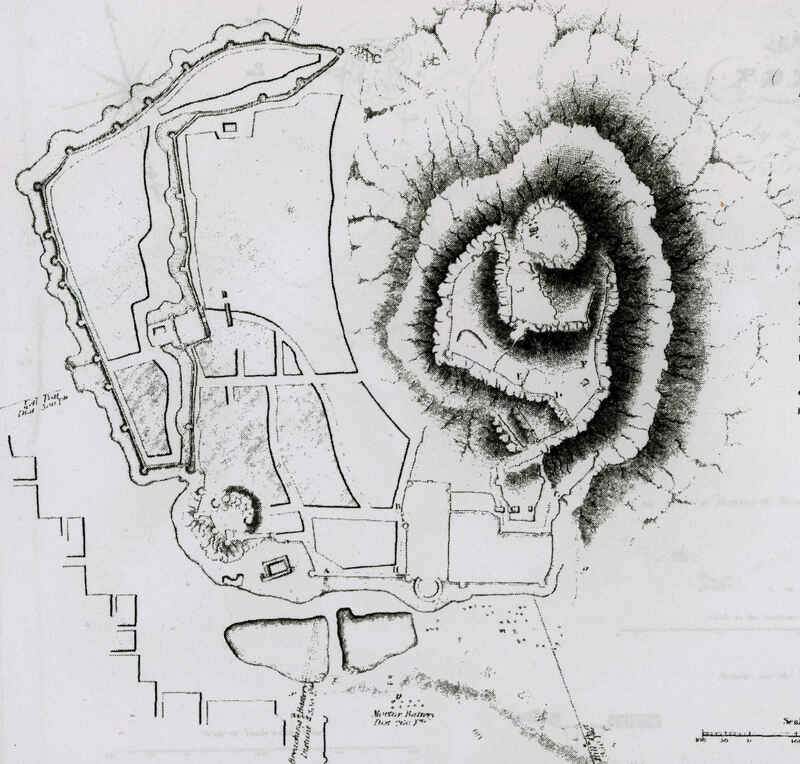 In 1819 occurred the storming of the supposedly impregnable hill fort of Copaul Droog, and his part in this action was referred to when he was awarded the K.C.B. We shall return to the taking of Copaul Droog. Fraser himself fell ill, and departed Rangoon on 31 October 1824 “in consequence of serious indisposition”, returning to Calcutta. Fraser had several periods of leave before this, but the furlough to the UK from 1825 to 1828 must have been the most welcome. In 1828 he was appointed by the Court of Directors to succeed to the General Staff, and he returned in that role to Madras. He was appointed to the Command of the Ceded Districts (an area of India “ceded” to the British East India Company by the Nizam in 1800). An appointment of Temporary Brigadier-General in June 1829 followed, and Major-General in July the following year. (Think: “Be My Little General”). His appointment as a Knight Commander of the Bath was announced in the London Gazette of 10 April 1832. He was on furlough again from 1833. I note a very important piece of military correspondence from him that year, indicating a humanitarian side to his nature. In this he stated that an “Asylum for the relief of the Native poor” has been established at Bellary, and requested the sanction of Government for the issue of medicine to the Sick admitted into the Asylum. His appointment as a Lieutenant-General was reported in the London Gazette of 26 November 1841. The taking of Copaul Droog was key to the career of Hugh Fraser, so it is worth appraising what it involved. And for this we are indebted to a book by Edward Lake on the taking of hill fortifications in India, published in 1825 although written in 1822, snappily entitled Journals of the Sieges of the Madras Army, in the years 1817, 1818, and 1819, with observations on the system according to which such operations have usually been conducted in India, and a statement on the improvements that appear necessary. I note that one of the subcribers was one “Fraser, H. Colonel”. Fraser had been involved in the successful taking of the Fort of Asseerghur in March and April 1819, before moving on to Copaul Droog in May of that year. Copal Droog lies a couple of hundred miles south west of Hyderabad, just to the west of Bellary, where Fraser became district commander. At this time, though, he was Lieutenant-Colonel in the Native Infantry. 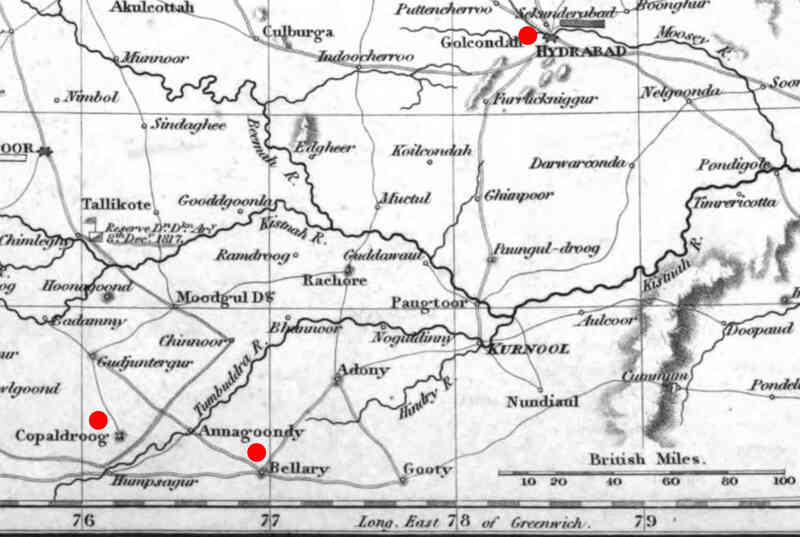 I have spotted the locations of Copal Droog, Bellary and Hyderabad on this contemporary map extracted from The Maps and Plans illustrating the Memoir of the Operations of the British Army in India, during the Mahratta War of 1817, 1818, & 1819 by Lieut.-Colonel Valentine Blacker (1821). The works of Copal Droog are of extraordinary magnitude and strength, and (as will appear by the plan) very complicated. 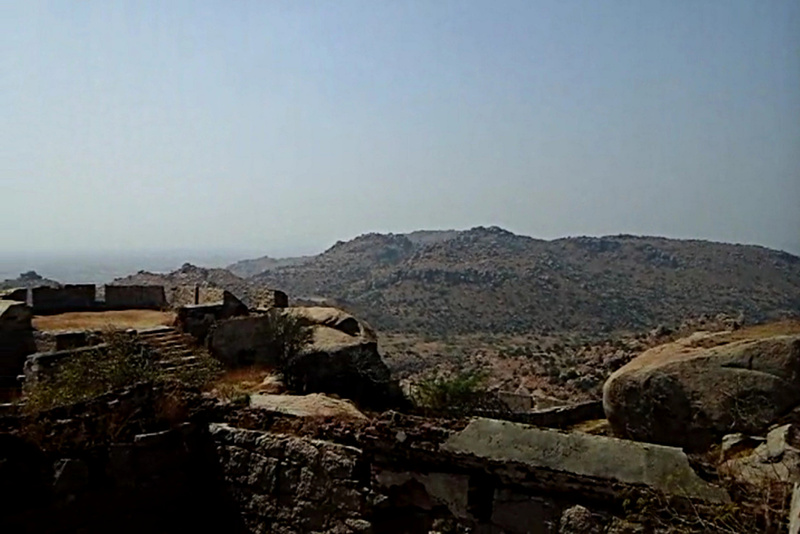 The hill, which forms the upper Fort, is about 600 feet high above the plain, and is totally inaccessible on three sides. The fourth, or Eastern side, is encircled with walls to the very base, where a strong rampart terminates the hill fortifications; below which there are, on this side, two additional inclosures, each consisting of a very respectable rampart with towers. Image of Copaul Droog in more recent times. Image courtesy of Paul Mackenzie Fraser. Plan of Copaul Droog, drawn up for Edward Lake’s work on the Sieges of Madras, published in 1825. This then was the target. For several days in early May the walls were pounded by the British weaponry until a breach was considered practicable, and the army prepared to storm the lower forts. 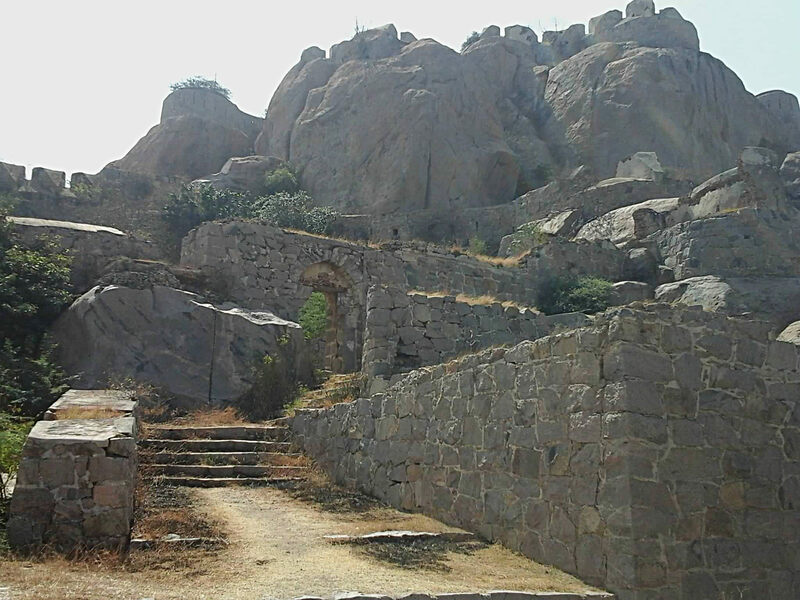 At this point the Indian Garrison surrendered, and 1400 men marched out and the forts were occupied by the British troops. 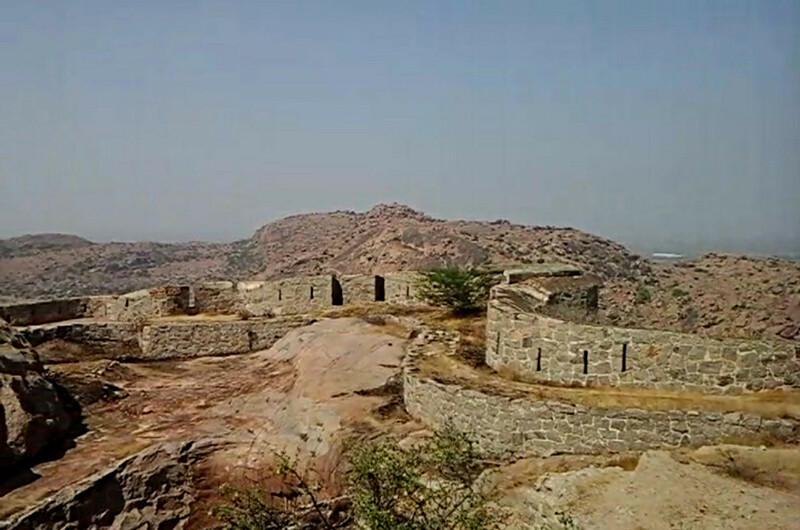 The upper and more challenging fort confronted them. There were negotiations to persuade the Rajah to surrender, but it appeared that the Rajah was simply playing for time. The period fixed upon having arrived, and it appearing that no reliance could be placed upon the Rajah’s professions and promises, the following plan of attack was decided upon. Two columns, of 4 companies each, to escalade the walls at the points G and H; and having gained admittance, to support each other. A galloper gun to accompany the left attack, for the purpose of blowing open the gate B. Advantage to be taken of the confusion of the enemy, to follow them to the summit of the hill, if possible. A reserve of 3 companies to advance from the mortar battery, to reinforce the column which should first establish a footing. At twelve o’clock precisely, both columns advanced to the assault. The right under Captain Cuppage, of His Majesty’s 53rd Regiment; the left under Captain Tew, of His Majesty’s 34th Regiment; the whole commanded by Lieutenant-Colonel Fraser, of the 12th Native Infantry. Both escalades succeeded, and the gateway was blown open at the same instant. The troops rushed in, and effected a junction at the gateway C, which afforded cover to a considerable number of men. At this point, they were checked by a tremendous shower of stones, which was hurled from the rocks above … … … the enemy intimidated by the perseverance and gallantry of the attack, called for quarter, which was granted; and the Garrison, to the amount of 500 men, were marched out prisoners of war. 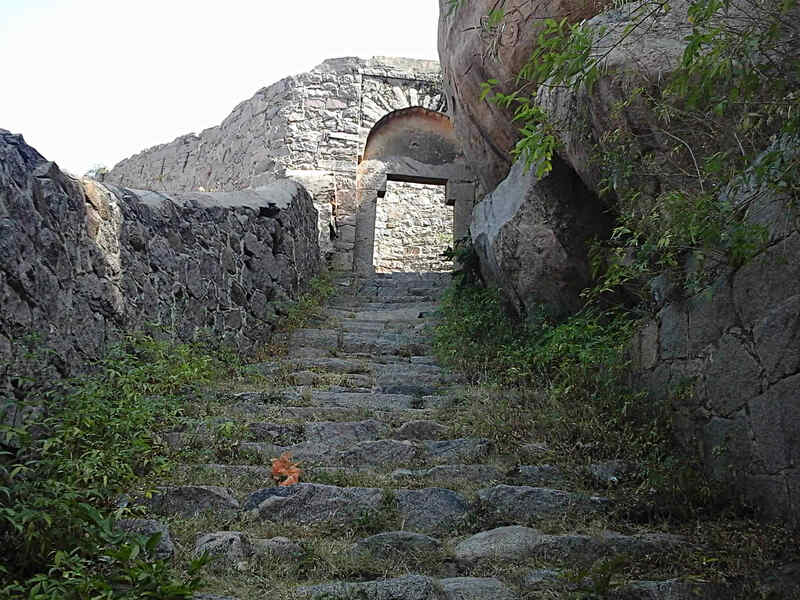 The steps up which an assault would proceed against a hail of weapons from above. Image courtesy of Paul Mackenzie Fraser. After a good deal of firing the Killedar’s people hoisted a white flag, and demanded terms, and the Killedar after much hesitation came out and delivered himself up, on my assuring him at the gateway, he being on the top of the wall, that his life should be spared; and his whole garrison surrendered on the same terms. The short biography in Dod states: “mar. 1st, 1811, Helen de la Sauvage”. The entry in the British India register of the death of a child gives a different variant of her name: “Mary Jane Helen Sauvagère”. However, I believe the most reliable version will be the one on her unusual headstone, erected by her husband in Bellary, Karnataka, where Hugh Fraser was district commander for several years. 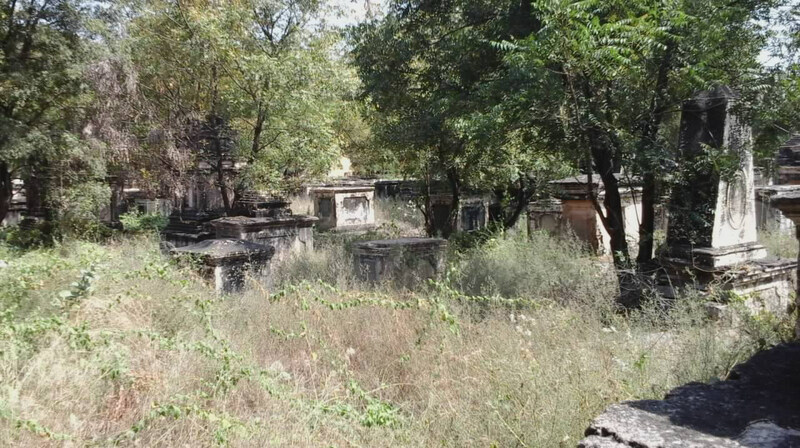 The untended graveyard in Bellary. Image courtesy of Paul Mackenzie Fraser. The unusual top of Helene’s memorial in Bellary undoubtedly has Indian associations. Image courtesy of Paul Mackenzie Fraser. There is no record of Helene’s parents, but when you look at the sponsors of the baptisms of her children it all becomes clear. Mary Jane Ann, the daughter of Lieut.-Colonel Hugh Fraser, Commandant of Pondicherry and of Mary Jane Helen Sauvagere, his wife. Aged 2 years, 9 months and 19 days. Their second child, Aeneas, entered the military in India like his father, but, I understand (although I have not seen the evidence) died on his passage home in the 1840s. There definitely was a third child, a Mary Lydia, whom it is believed was born on 7 February 1816 in Tamil Nadu, but I have not seen the evidence for it myself. However, she was to marry in Inverness in 1835. At the time Hugh Fraser was Commandant of Pondicherry, obviously the city and region were under British control. Hugh was back in Britain in 1827, and seven years after the death of his first wife, married Isabella, the third daughter of John Mackenzie, Esq., of Kincraig. Several daughters of earlier Kincraig families are buried at Kirkmichael. Isabella was already a veteran of India, as she had married her first husband, Allan Cameron, a Lieutenant in the Bengal Presidency Artillery, in 1821, and had one daughter by him. Her husband had died later in that year of 1821, the year after Hugh Fraser was widowed. By 1827 both Hugh and Isabella were ready to commit to another partnership. 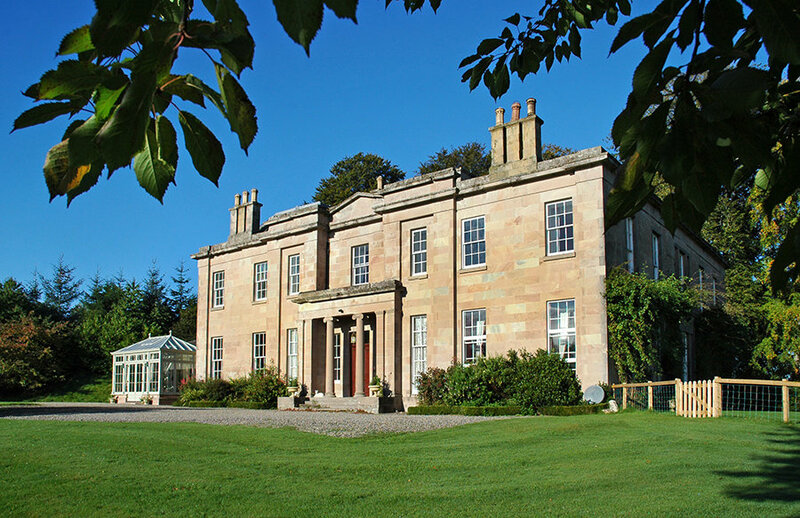 Kincraig House, nowadays the comfortable and welcoming residential and dining Kincraig House Hotel. Two Mackenzie of Kincraig daughters are buried at Kirkmichael. Photograph by Jim Mackay. Their marriage record is in the register for Rosskeen, the parish within which Kincraig lies. 1827 … Col. Hugh Fraser Madras Army E:I:C:S. & Mrs Isabella MacKenzie, Kincraig, Relict of the late Capt Allan Cameron of the Bengl. He. Artillery were married 16 October. And then it was back to duty in India. Their first two children were born in India. Sacred / to the memory / of / HELEN FLORA FRASER / the beloved daughter / of / Lieut. General / Sir HUGH FRASER K.C.B. / and / ISABELLA FRASER, / his wife; / born at Bellair / East Indies, / 29th October 1828 / died at Cromarty, / 19th October 1840. Altho' he pierced thy heart. Their second child to be born in India was the ancestor of correspondent Paul Fraser. &nbs; To Major Du Prat, Cape Town Volunteers. My Dear Major,–The widow of Lieut. Fraser desires me, in her name, to return her heartiest thanks to the Volunteers for their kind attention to the funeral of her late husband, and for paying the last honours to his remains. I have to request that you will at the same time thank them for the prompt manner in which they responded to my request to inter with military honours the poor young stranger, in whom I was much interested. I felt it particularly kind, so many turning out after having been on duty in the morning.– Believe me, yours very truly, J.M. Hill. Their third child, Isabella Forbes Fraser, according to some websites was born in Meldrum, Aberdeenshire, which seems unlikely, in 1834. I have not found her in any baptism record. She would marry, at Braelangwell, Beauchamp Colclough Urquhart on 5 August 1856, aged 21, so the birthdate at least would appear to be approximately correct. I think it is probably she (“Isabella Fraser”) whom I see in a London school for young gentlewomen in 1851, aged 16, and born in “Scotland”, so unfortunately there is no Census record showing her parish of birth. There were two children from the marriage, but she died a young mother in 1860. Hugh Fraser L.S. of Major General Sir Hugh Fraser K.C.B. E.I.C.S. and Lady Isabella Fraser residing at Red-Castle was born 26th December eighteen hundred and thirty six and Baptized 27th January 1837 By the Revd. John Kennedy of Killearnan. And their fifth child was born at Braelangwell itself, in 1841! I see on the web that Alexander became a Captain, and married Lily D’arcy on 5 March 1867 in King William's Town, Eastern Cape, South Africa – but I have not seen the evidence myself, and given how the genealogy of Sir Hugh’s family is riddled with errors, I am treating this with caution. Given that Sir Hugh had been born in 1773, it is not surprising that Alexander, born at the tail end of 1841, was his last child. That year was an important one for him: he attained the rank of Lieutenant General in November, and was appointed Deputy-Lieutenant of the shire of Cromarty. In reality he had been back in the UK since the very end of 1833, when arrived (Perthshire Courier 2 January 1834) “Per ‘Juliana,’ from Bengal and Madras – Major-Gen. Sir Hugh Fraser, K.C. B., and lady”. We even know where he resided initially (Morning Post, 28 December 1833) “Sir Hugh and Lady Fraser and family, at Crawley’s Hotel, Albemarle-street, from Madras”. On his arrival he attended St James’s Palace on 21 February for a great honour (Public Ledger, 26 February 1834) “Ceremonial the Investiture of Major General Sir Hugh Fraser with the Ensigns of a Knight Commander of the Most Honourable Military Order of the Bath”. It had been awarded in 1832, but this was the formal occasion. 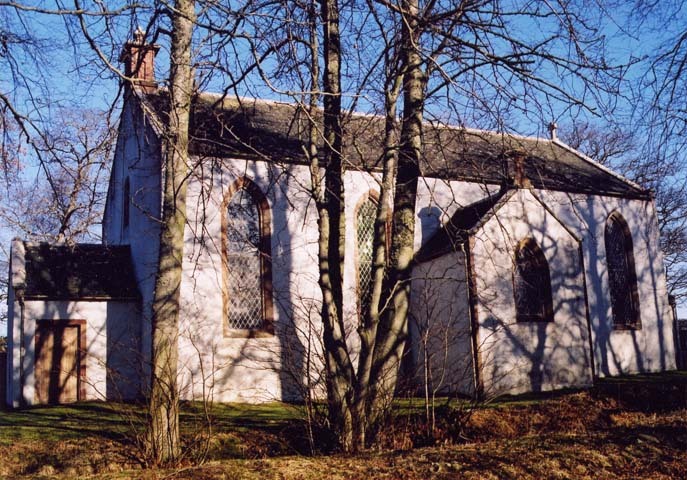 Kirkhill: 1835 Janry 8 Married of this date at the English Chapel Inverness by Mr. Fivy Capt. H McKenzie Esq to Miss Mary Lydia Fraser daughter to Sir Hugh Fraser residing at Achnagairn. Witn. Sir Francis McKenzie of Garloch and Major Fraser of Newton. Inverness: [January 1835]: 7th. Capt. Hector Mackenzie H.E.I.C.S. 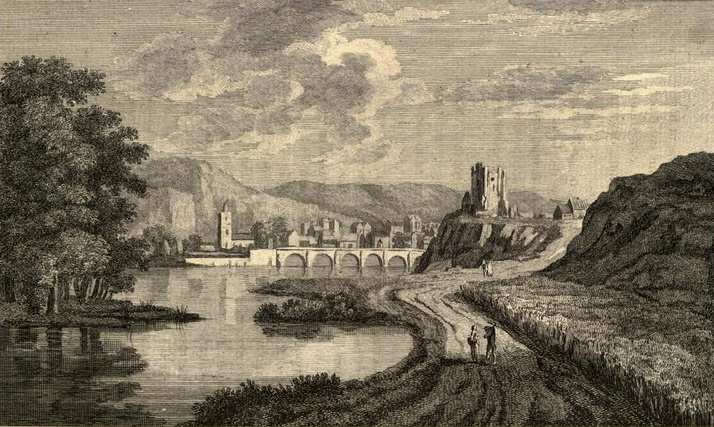 residing at Balnafary Inverness and Miss Lydia Fraser, Eldest daughter of General Sir Hugh Fraser, Auchnagairn – by the Revd Charles Fyvie. Alas, Captain Hector was to die in India and they had no surviving children. Sir Hugh’s other surviving daughter from that first marriage married in the Castle of Redcastle, in Killearnan in the Black Isle, in 1838. Redcastle is now a ruin, but it must have been a dramatic setting for the wedding. Their three children were James Gawler (1840–1880) (presumably in honour of the friendly Governor), who was to become Major James Gawler MacLeod, briefly 14th of Raasay, Helen Jane Gray (1842–1929) and Flora Ann (1844–1885). While we know the locations where James was buried, I have not found where Mary Frances Theodosia ended her days. Some websites say she died a young widow in Australia, which is nonsense. On the death of James, she returned to the UK with her three children. In 1885, when her daughter Flora Ann Berners ms McLeod died at 8 Rue Alexander Taylor, Pau, in France, she was living at the same address, but her movements thereafter I know not. Now, you will notice the word “Redcastle” appearing several times during this period of Sir Hugh’s life. Abandoned as recently as the 1940s, the castle of Redcastle originated in the medieval period. Like so many other ancient buildings, it is now a ruin. The current sadly derelict condition of Redcastle; photograph by Jonathan Wordsworth. STOLEN OR STRAYED, FROM REDCASTLE, ON THE 11th JULY. A Grayish dun FILLY, about ten hands high, with a black streak on its back, black Mane and Tail, and black Feet – marked a little on the knees. Whoever can give information of the above, so as to lead to her recovery, shall be rewarded, if required. Any person keeping her after this notice will be prosecuted. Apply to Sir Hugh Fraser, at Redcastle. You will have noted that son Hugh was born in Redcastle in 1836 and daughter Theodosia was married in Redcastle in 1838. The general’s children were so spread out in time that children were marrying when other children were being born. Braelangwell had been on the market for a while, and there were competing potential buyers. 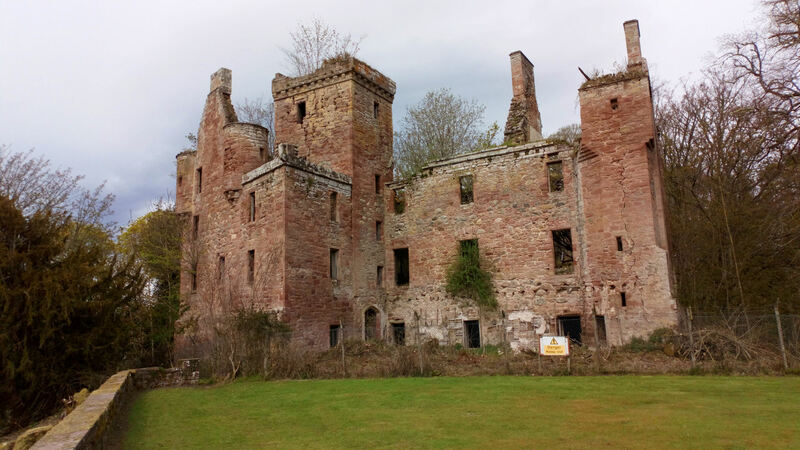 Sir Hugh, from his nearby Redcastle home, must have been looking it over for a while, before deciding to invest in the estate on the north side of the Black Isle. Braelangwell was noted for its arable farming. It was famed for having flour mills (i.e. utilising the more demanding but higher value cereal wheat) far earlier than other estates where barley and oats were the normal corn crops. Sir Hugh appears in person at a heritors’ meeting in the schoolhouse of Resolis on 17th December 1839, and frequently thereafter, so this would seem to be the time of their arrival. Braelangwell in the very early 1900s. The 1841 Census record provides a snapshot of the occupancy of Braelangwell House at this time. Other servants occupied homes in the nearby steading, but there was a troop of female and male servants in the house itself. Gen. Fraser Esq. 70 Army P.
Ann Gibson 24 F.S. / Katharine McDonald 40 F.S. / Hugh McLennan 23 M.S. / William Simpson 24 M.S. / Donald Matheson 18 M.S. / Donald McLennan 19 M.S. / John McKenzie 17 M.S. / William McLea 18 M.S. John McLennan has pointed out to me that his ancestors, John McLennan and wife Isobel McIntosh, and family, had been in Redcastle and moved to Braelangwell in the same time period as Sir Hugh did, and in fact are shown as adjacent to Braelangwell House in the 1841 census. When Sir Hugh bought Ardmeanach, the McLennans became the farmers there. They were clearly well regarded by Sir Hugh. The 1851 Census record sets out the diverse origins of everybody occupying Braelangwell House at that time. Sir Hugh Fraser head m 77 Invsh Inverness Landed Proprietor, & Lieut General H.E.I.C.S. Braelangwell before Hugh Fraser purchased it had passed through several owners in fairly short succession and was, according to the Reverend Donald Sage in his Memorabilia Domestica, run down. When Hugh purchased it in 1839 he immediately began to implement improvements. And naturally, one of the first things he looked to improve was Braelangwell House. 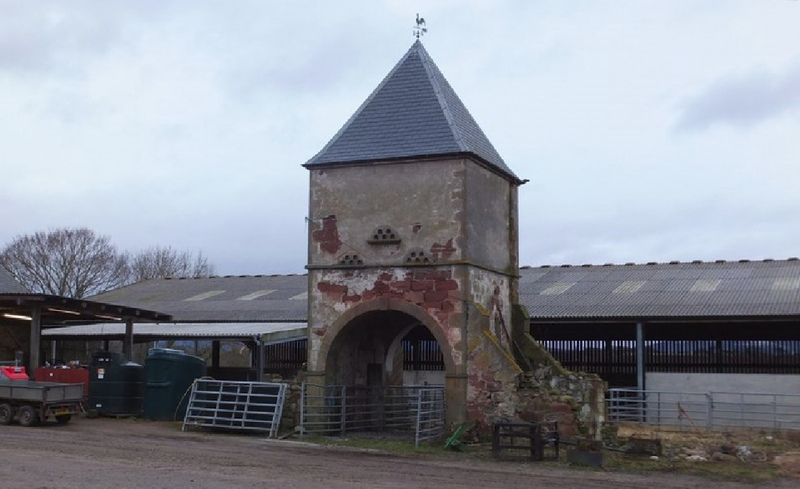 Fraser commissioned architects to remodel Braelangwell House and farm buildings. Different sources suggest William Robertson (who died in 1841) or perhaps Archibald Simpson had commenced the operation, but all are agreed that James Ross finished the work. The new façade was constructed over the period 1839 to 1845. Work on servants’ cottages, a washing house, additions and repairs to offices and bridge are referred to in a journal of 1845, and the South Lodge is mentioned in the Inverness Courier of 1847 seen below, upper left. And in the Inverness Courier of 29 January 1845 we see him organising roadworks as well. I believe the road mentioned in the Courier of 22 July 1846 (below, lower left) will be the road from the South Lodge to Braelangwell House. The advertisement for erecting the South or Porter Lodge itself appeared the following year (on the right, below). Hugh Fraser was giving much employment to the area through these improvements. He also gave generously to support the poor. However, due to his involvement in the Disruption, he became the most unpopular man in Resolis. It was from Braelangwell House that the Presbytery, accompanied by a party of gentlemen and ladies, set out to induct the new minister against fierce local opposition. The previous minister, Donald Sage, had left the Established Church for the Free Church, and several hundred parishioners turned out to prevent the induction of his replacement. Sir Hugh Fraser brandished a pistol which he had received from one of the Coastguard. Though he later claimed he did not fire it, certainly shots were fired. The decision to abandon the attempted induction at Resolis was a wise one. The church halfway up Fanny’s Brae had proved a more complex challenge than the hill fort of Copaul Droog. Following the riot, Hugh Fraser was closely involved with the arrangements for the considerable numbers of special constables deployed during the disturbances. Given he was a deputy Lord-Lieutenant, this was perfectly logical, but could only have exacerbated his unpopularity in the region. The former Church of Scotland in the centre of Resolis, around which the battle was fought. Photograph by Jim Mackay. 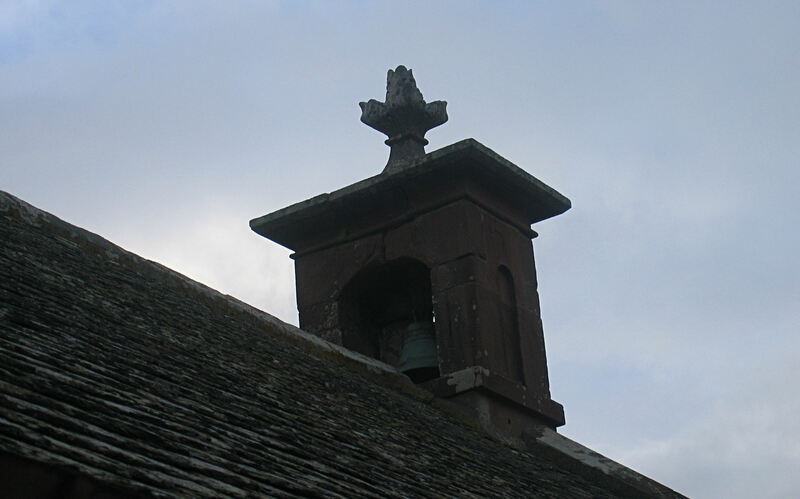 The curious belfry of the former Church of Scotland; the bell was rung so vigorously during the riot that belfry repairs were required. Photograph by Jim Mackay. Fraser of Braelangwell’s carriage was subsequently stoned near Invergordon. For several years following the Disruption, the rather unpleasant and vindictive review to be found in the session minutes of past financial transactions was headed by Hugh Fraser. In this, the seceding Reverend Donald Sage was threatened with legal action unless any omissions were rectified. The records of this period ooze with bitterness, and this ongoing war with the highly-regarded Donald Sage must have perpetuated Sir Hugh’s unpopularity in the parish. Returning to the riot itself, the General had 50 years’ military service in India and Burma, when no doubt he often had recourse to his pistol. The contemporary reports and subsequent trial proceedings indicate he was instinctively taking the same approach to a civil affray in the Black Isle. But to present a pistol to Resolis parishioners, some of them undoubtedly his own tenants! His and Dame Isabella’s epitaph contains the rather revealing text: “Those who knew them best, were those who regretted them most deeply.” And yet, as I say, the General was amongst the most generous in providing donations to the poor or seeking improvements for the parish. On the character of Lady Fraser, we have little information. 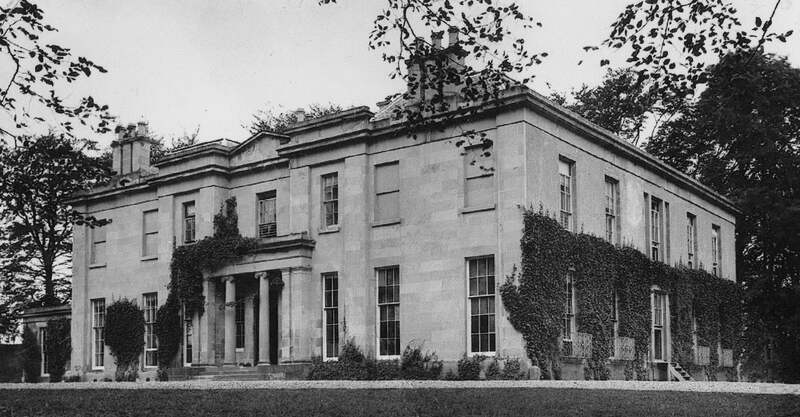 I have one undated letter from her, written during the 1843 Disruption riots when they must have felt as if they were back in a military zone in India – “the natives are revolting.” In this she offered shelter in Braelangwell House to Mrs Macintosh, wife of the principal tenant in Resolis, who had adhered to the established church. This one simple letter conveys a practical and kindly nature. It also suggests a potential family connection. The Genl & I will be glad to give you all the protection we have for ourselves. Put on Auntie’s cloak & a shawl (not a bonnet) on your head & come walking slowly with Murdo Urquhart. I will have a bed ready prepared for you. I note that both Sir Hugh and Dame Isabella were communicants, Sir Hugh seeking entry as soon as he arrived in the parish and the two of them continuing thereafter. And Sir Hugh was always at the forefront in church activities. The pair were clearly a devout couple. Sir Hugh devoted himself to improvements on the estate whilst actively engaging in public affairs. He was appointed Vice-Lieutenant of the County of Cromarty in 1845. The Late Lieut.-General Sir Hugh Fraser, K.C.B.– We noticed last week, the death of this gentleman, which, though it took place at a ripe old age, was sudden and unexpected. His remains were interred upon Tuesday last in the family burying ground, in the beautifully situated Churchyard of Kirkmichael; attended to their last resting place by a large number of friends and neighbours. The mourners and pall-bearers were Major Mackenzie of Kincraig, the brother-in-law of the deceased … Colin Lyon Mackenzie, Esq. of St Martins… Some years after his return home he became the proprietor of Braelangwell in Cromartyshire, which he made the place of his residence, and which, by a judicious expenditure of money, he greatly improved and enhanced in value. … The estate descends to Mr John Fraser, his eldest surviving son, still in minority, who lately left this country, and is now on his passage to India. Lady Fraser followed the General soon after, in 1852. Sir Hugh Fraser’s legacy can be seen on the detailed 1844 plan of the estate by surveyor G. Campbell Smith of Banff, an extract of which can be seen below. The mansion, greatly expanded in size from before his time, forms a complete square. A porch on the south face indicates the front door has been moved to the south. For those travelling from Fortrose, the road now branches off at the Porter’s or South Lodge and comes directly down by the Ballycherry Burn to Braelangwell House. The road which previously came in from the east has disappeared. 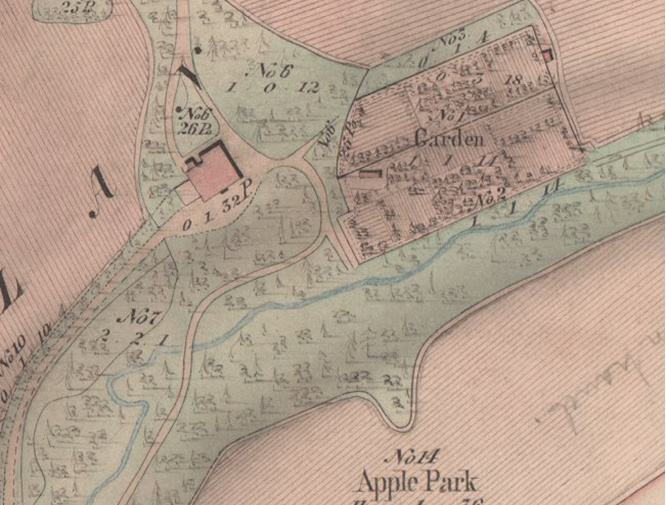 The orchard has been re-named “Apple Park”. Even the layout of the plots in the Walled Garden is set out. Following Sir Hugh Fraser, the passage of the estate followed his deed of entail. The earliest known occupants of Braelangwell were Urquharts. Surprisingly an Urquhart dimension was to return to Braelangwell, through two of the children of Sir Hugh Fraser. First, John Mackenzie Fraser of Braelangwell married in July 1856, at Meldrum, Elizabeth, daughter of Beauchamp Colclough Urquhart of Meldrum, Aberdeenshire, and their son (born in Barrackpore in 1857) became Hugh Kenneth Fraser of Braelangwell. And, in a charming reverse, Isabella Forbes Fraser of Braelangwell (c1835–1862) married the eighth Urquhart laird of Meldrum, Beauchamp Colclough Urquhart (1830–1896) the following month, in August 1856, at Braelangwell. 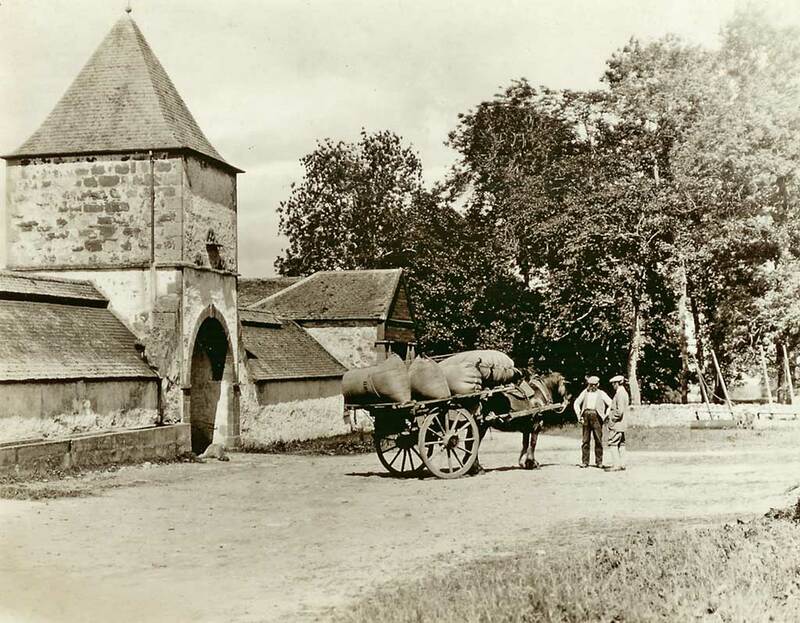 The pigeon house, or doocot, referred to above the entrance way to the farm buildings, crops up in the early photograph below, and remarkably is still there! The Braelangwell steading with doocot. photograph by Alpin Stewart, licensed under Creative Commons.